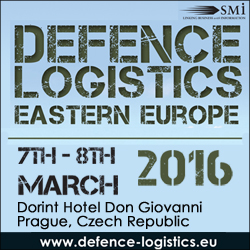 SMi Group Reports: Eastern Europe’s only Military Logistics conference will take place on the 7th-8th March 2016 in Prague, Czech Republic. Join leading defence logistics experts in Prague this March and hear from Brigadier General Jaromir Zuna, Director Support Division, Armed Forces of the Czech Republic who will be chairing the conference as well presenting on “The Czech Approach to Defence Logistics.” His presentation will focus on: the Czech Armed Forces capability to support multi-branch joint operations and exercises; the value of strategic logistics planning during peace and war and modernising the logistics structure for 2020 and beyond. With the current increase of expenditure being invested within the Czech Armed Forces, this is a presentation not to be missed. Defence Logistics 2016 is the only military logistics conference exclusively focused on the Eastern European defence community. It aims to bring together members of logistics commands from across the region to discuss the challenges of modernising their logistics forces through training, international cooperation and procurement, while at the same time going through extensive budget reforms. The packed agenda features 20 case study driven presentations, speakers representing both military and industry sectors, a panel discussion, plus over 3 hours of networking. Defence Logistics Eastern Europe 2016’s gold sponsors include: Hutira and Miro Technologies. The 2016 event is also sponsored by HIAB.